Today Nintendo announced the new DSi, the next generation of thei DS line of handheld gaming consoles. Well, not exacly the next generation, but the next version. 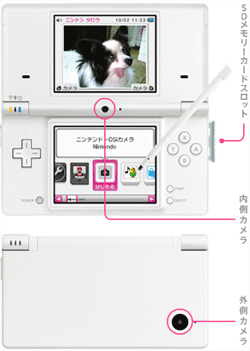 Looking at the specs, the DSi is to the DS what the GBC is to the DMG. (The original 1989 version of Gameboy) A spiced up version, but still basically the same thing. This is good in that games can have a smooth transistion between version 1 and 2, but because it means the hardware is still as weak performance-wise as it was in the first DS. So let’s have a look at the specs. The information comes from Joystiq. CPU power - Unchanged. Period. Unless Joystiq have received too early info and it sports some kind of turbo mode à la GBC, this is a disappointment. Cameras - Here we go… The DSi has not one, but two cameras. One high-res on the back (Presumably) and one low-res on the hinge consequently. Seeing that they’re targetting girls, judging from their video, it’s not surprising that they’re trying to break into a market that has been dominated by cell phones in Japan for the last few years. But will they succeed? Future will tell. They promise video chat, but I suspect the CPU is a bit too slow to cope with simultaneous compression and decompression of video and audio data. Just saying. There’s also a camera app with a few warp effects and other meaningless things. The GBA slot is gone - This was an anticipated change. Seeing that it was only really used by Guitar Hero, Opera (The browser) and backup devices, I can see why they want it gone, since removing it also allowed for a slightly slimmer form factor. We’ll have to live without Guitar Hero, we’ll get a new browser for free, and N wants us to stop pirating and using homebrew. All is as it should. Storage - Here’s something that’s interesting for me, since I’m mainly interested in homebrew. 1) Nintendo is promising onboard storage. They’re not saying how much, but hopefully more than the current 256 kB firmware area. 2) A built in SD slot! I mean wow, here’s a great ptoential for a new kind of cheap passcards. The danger with that is that N will come with a firmware upgrade that breaks the compatibility with said devices, and since they wouldn’t be upgradeable. (Since in my little fantasy that’s what’s going to make them cheap in the first place) But yeah, I’m excited about the SD slot actually. Might be the killer feature for homebrewers, although my M3Real already has an SD slot that works perfectly fine. App Store - To make the onboard storage useful, they’ve added an App Store, much like the Wii Shop Channnel. In fact they renamed the Wii Points to Nintendo Points just honour this new feature. Music player - An MP3 player, possibly with the possibility to buy music online. On a more superficial level… I’m also noticing that they re-arranged the LEDs a bit. They’re now on the left side rather than on the right side. The power LED changed from green to the evr so popular blue, and wireless activity has now got it’s own dedicated, yellow LED. So, in essence, all new known hardware features are the cameras and the SD slot. It will sell, I am sure of it, but with its under-powered hardware, will it last? I also like how he’s able apply a different mood from what was inended in the original recordings, to each clip. This is done by changing the context by choosing the order he puts the clips in, and also by mood-creating music. Much of the work consists of talk, and there’s also alot of music. I imagine some of it (The electro music) was produced by himself, but most of it is probably sampled radio material, and those parts, I think, is a good representation for the USA in different ways. I imagine some proud Americans would be genuinely insulted by hearing this work. But for us other people, this is a recommended piece of art! This page was previously hosted on http://gameboygenius.8bitcollective.com/wordpress/category/review/ (*).